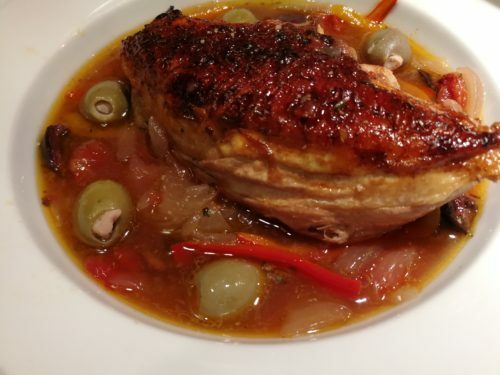 Slow Braised Chicken Provencal. Autumn has finally arrived here in Virginia. Yesterday, we finally had our first “chilly” morning in the high 40s and our first fire in the fireplace for the season. Today is rainy and chilly and the perfect day for this recipe. 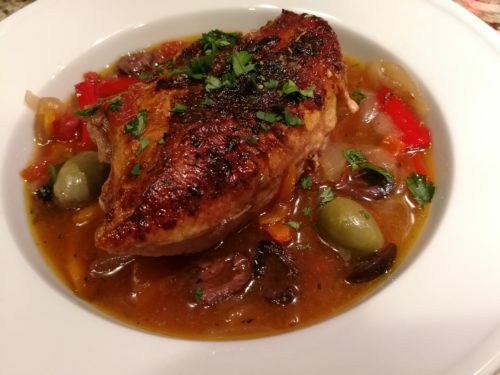 My Slow Braised Chicken Provencal will warm you up on a cold day. 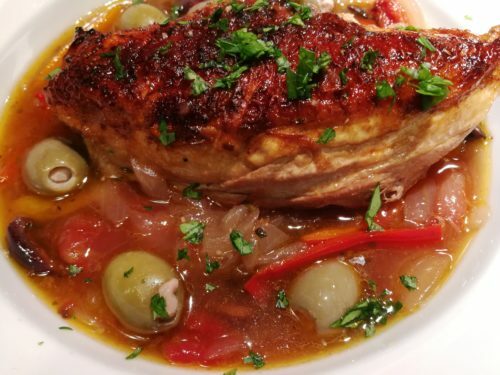 My Slow Braised Chicken Provencal gets its name from a spice called Herbes de Provence. Herbes de Provence is an herb blend that comes from France. My husband and I use this French spice blend a lot in our cooking. 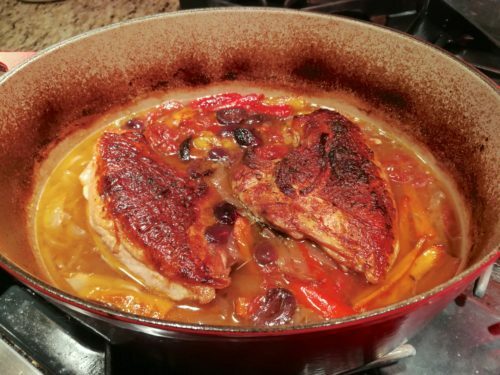 To make my Slow Braised Chicken Provencal, start by seasoning some bone-in skin-on chicken breasts with salt and pepper and then searing them in olive oil and butter in a Dutch oven on the stove over medium heat. Just sear until the skin sides of the chicken have turned a nice golden brown. 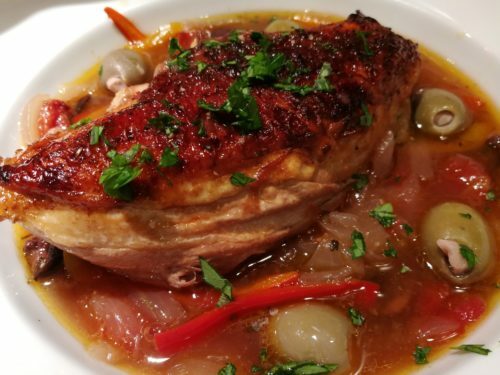 Set the seared chicken aside on a plate and keep warm. In the same Dutch oven, sweat some sliced onion until translucent. Add garlic and saute a few minutes. Be careful not to brown or burn the garlic. Deglaze the pot with white wine and add the seared chicken breasts back to the pot. Sprinkle some Herbes de Provence spice mix over the chicken breasts. Add some chicken broth and some diced tomato to the pot. Let that simmer, covered, for about 30 minutes or more. Add more chicken broth if needed. 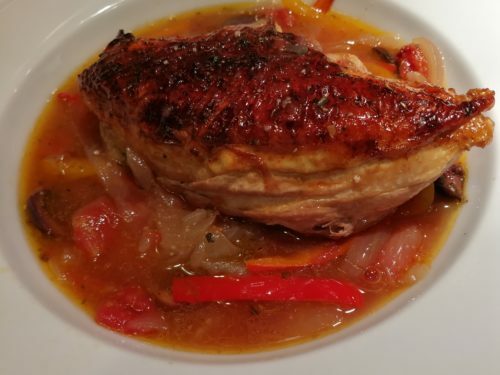 When the chicken is very tender, add some sliced bell pepper. Continue simmering, covered, until the bell pepper has softened. Add some pitted Kalamata olives and warm through just before serving. Remove the chicken breasts to a holding plate. For extra richness, stir a pat of butter into the vegetable sauce mixture. Ladle the vegetables into serving bowls and top with the chicken breasts. Garnish with garlic stuffed olives. You can find garlic-stuffed green olives and Kalamata olives at your grocer’s olive bar or jarred olive section. Sprinkle on some finely chopped Italian parsley and serve! Offer with your favorite red or white wine or even a rose. 1. Season the chicken breasts on both sides with salt and pepper. Set aside. 2. In a Dutch oven pot over medium heat, warm the olive oil and butter. 3. 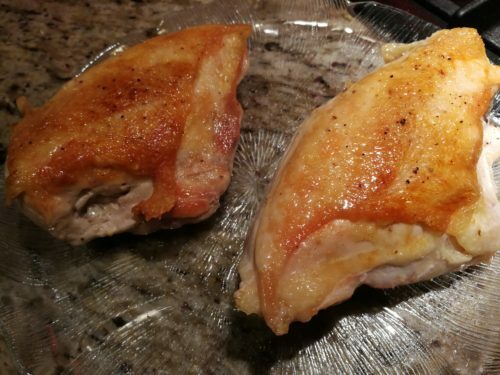 Quickly sear the chicken breasts, skin side down, until they are a nice golden brown. Turn and saute the other side. You do not want to cook the chicken through, just get a nice brown color. 4. 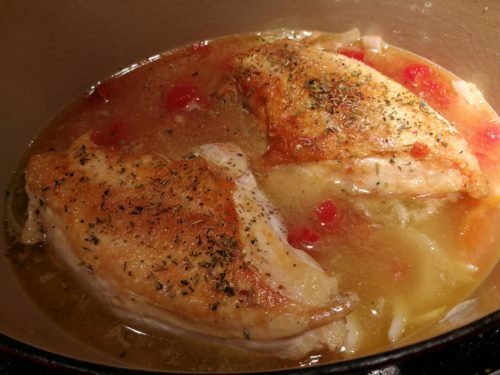 Remove the chicken breasts to a plate and keep warm. 5. 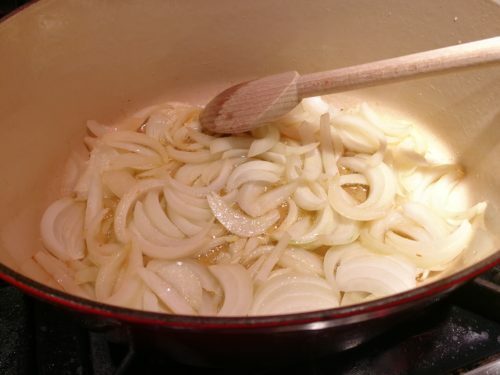 In the same Dutch oven pot, over medium low heat, sweat the onions until they are translucent. 6. Add the garlic and saute a minute or so. 7. Deglaze the pot with the white wine. 8. 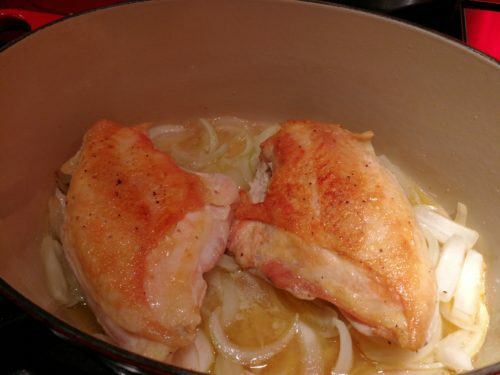 Return the chicken breasts to the pot. Place them skin side up on top of the onions and garlic. 9. Sprinkle the Herbes de Provence over the skin side of the chicken breasts. 10. Add the diced tomato and half of the chicken broth to the Dutch oven pot. 11. Cover the Dutch oven pot and let it simmer over medium low heat for 30 minutes. Check the chicken and add more chicken broth as necessary. You don’t want the vegetables to dry out. 12. 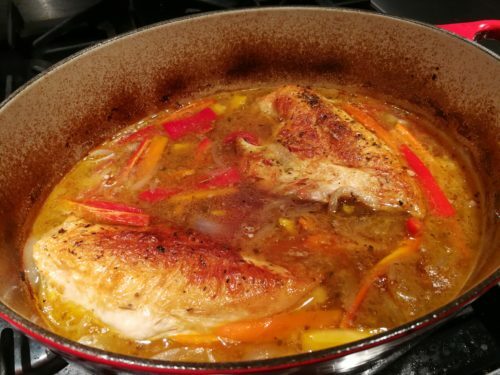 When the chicken is becoming tender, add the sliced bell pepper. Cover and continue to simmer until the pepper softens. 13. 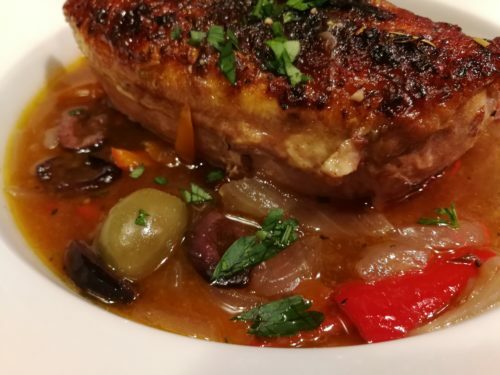 Just before serving, add the Kalamata olives to the pot and warm through. 14. Remove the chicken breasts to a holding plate. 15. Stir the optional butter into the vegetables to finish the pan sauce. 16. Ladle the vegetables and pan sauce into serving bowls. 17. Top with the braised chicken breasts. 18. Garnish with the garlic stuffed green olives and finely chopped parsley. Serves 2 as a main course. Offer with crusty bread and your favorite red or white wine. Start with a Caesar salad with homemade croutons. 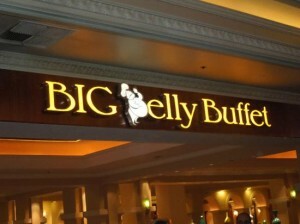 Variations: For extra decadence, serve the chicken breasts over my Easy Mashed Potatoes and smother with the pan sauce. 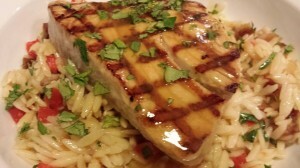 Or you could serve the chicken breasts over buttered egg noodles. Add some sliced mushrooms when you add the bell pepper. 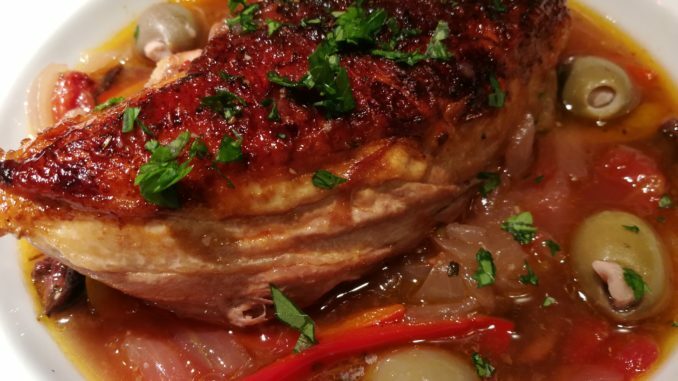 You could use bone-in chicken thighs in this recipe instead of the chicken breasts.